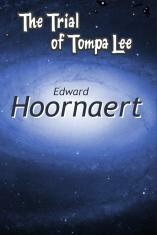 A couple months ago, I published an e-version of my science fiction novel (with romantic elements), The Trial of Tompa Lee . 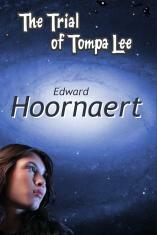 The book had been published a few years ago in hardcover by Five Star Speculative Fiction. (For more information and sample text, click here. This is the story of Tompa’s new cover, targeted specifically for the e-book market. The first job of an e-book cover is to look enticing as a thumbnail. It should also make a promise to readers and tell them what the book is about. For an e-book, I decided that the old cover didn’t cut it. While Alan M. Clark’s illustration for Five Star beautifully captures one of the book’s dominant impressions (a lonely woman being hunted on an alien planet), it’s simply too small for its new purpose. I decided to create my own cover, and I’d like to share my thought processes. I’ll warn you up front that I’m no artist, and there was a lot of trial and error involved. I used Paintshop Pro, but any program that lets you use layers would work. Each of the following elements is on a separate layer, allowing me to fiddle to my heart’s content without having to redo the other elements. Many astronomy pictures are readily available on the Web. 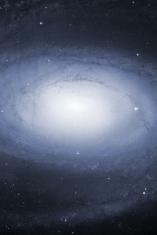 I chose M81, a spiral galaxy, as seen by the Hubble Space Telescope. This is the background image for the new cover. I surfed the Web to determine a good size, and expanded the picture to 1600 pixels by 2400 pixels. Later I gathered that Amazon really prefers, a height of 2500 pixels, so I changed the size. Both of these elements need to be plenty big so they can be read in a thumbnail. I wanted different fonts for both, nice and big. See? Readable even in a thumbnail. While the author’s name uses a standard, ho-hum font, the book title is fanciful. If the font looks familiar, its name might give you a hint where you’ve seen it before. It’s called Kentucky Fried Font. But this was tough. I’m no artist. No way I could draw Tompa as anything but a stick figure. I considered taking a photo of my beautiful daughter, but frankly, I am deeply in love with Tompa in a unfatherly way that made that idea feel kinda icky. I ended up going to a site that sells inexpensive stock pictures, dreamstime.com. After a lot of searching, I found this picture, and I knew right away THIS IS TOMPA. Definitely, this is Tompa Lee! So I added her to the picture, staring up at the stars with an expression that (to me, at least) seems wistful and longing. Notice how Tompa’s face seems to be illuminated by the stars? I had to crop out the background and resize the pic, but heck, even I can do that. Judging by the reaction of the dozens of people I showed versions of the cover to, this is the most controversial element. But I’m trying to entice you to spend a few hours with my imaginary playmates, and I want you to have some idea what you’re getting into before you spend your hard-earned money. You may have noticed that the tagline is larger than you’re used to seeing. On a paper cover, it should be smaller. For an e-book, though, it has to be big enough to be read in an Amazon-sized thumbnail. And that’s the new cover. If you’re a graphic artist, or even have a good artistic eye, you may be rolling on the floor laughing at the final product. 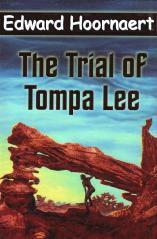 But that’s okay: there’s plenty of laugh-out-loud humor in The Trial of Tompa Lee , so I’m delighted if you guffaw. Anyone have any reactions or suggestions? Could you/have you done better? Great Cover, Ed! Thanks for sharing your process. Very interesting.